The wines we have selected for Take 2 demonstrate that Champagne is not the generic product so many people seem to believe but that history, vision and, of course, the grapes themselves, all contribute to each Champagne houses' own specific and unique style. We explain the differences and how they arise. If you telephone to Bollinger headquarters in France, more than likely you will hear part of the theme music to James Bond - the familiar dum di-di dum dum dum dum, a repeating seven note guitar riff which immediately conjures up the image of the world's most famous spy. Commercially it may be no bad thing to have your Champagne endorsed by a famous person. Although, why you would identify with a salacious hired assassin and cuckolder is beyond intelligent moral reasoning. Ian Fleming's books have Bond drinking another famous brand which is a blanc de blancs: made only from Chardonnay (the other two varietals in Champagne, Pinot Noir and Pinot Meunier, are both black grapes). This is an example of characterisation rather than endorsement. Ian Fleming sought to add to his character's personality through his selection of his wines and knowledge about them. But does it make a difference which Champagne you drink? Well, read for yourself. What it may say about you and your personality is beyond the scope of this article. The two wines we have selected are very different, and yet share many similarities: they both contain a large proportion of Pinot Noir, they both express an elegant style, they are drier than 'very dry', brut, (indeed, they are almost extra-brut), and they are roughly the same in terms of price. Champagne, strictly speaking, is not a terroir wine even if terroir influences the grapes which go into the blend. Non vintage Champagne is made from grapes which are sourced from all around the Appellation, and blended with wine made from several years. Even if producers agree that the grapes are the most important element in their wine (and they do), the assemblage (blending), ageing, and the philosophy, creativity and imagination of the winemaker, are crucial in determing a house style. Bruno Paillard Brut Première Cuvée. Very pale gold. Lovely citrus on the nose, redolent of a lemon grove. The Chardonnay (citrus) comes first and then the red fruits of the lovely Pinot Noir. Long finish. Restrained. Good definition even after a long time in the glass. Very small bubbles. Clean and refreshing. Terrific finesse. Disgorged July 2007. Alcohol 12%. Note 1Average blend is 45% Pinot Noir, 33% Chardonnay, 22% Pinot Meunier. Paillard own some 24 hectares of which 11 are designated Grand Cru. The company sources grapes from a further 76 hectares. Grapes from almost 36 crus go into the blend. All its own vineyards are maintained with organic agricultural practices. Reserve wines make up 20-40% of the total. The wine is aged for a minimum of 3 years before disgorgement. The wine is shipped 4 months following disgorgement with a recommendation that it should not be drunk until 6 months after the disgorgement date on the bottle. Dosage is no more than 8g/litre. They always use malo-lactic fermentation. They produce approximately 450,000 bottles per annum from a total of 100 hectares. The name of Bruno Paillard is unique in Champagne in that it is the name of the brand, the founder of the company and the name of the winemaker. Bollinger Special Cuvée. Light straw colour. Smooth. Clean and yet full-bodied. Long, lovely scented Pinot Noir which is immediately distinguishable. The wine has power - vinosity, with yeasty, bready toasty aromas. There's also some nuttiness which shows through. Complex. Great length and persistence coupled to a fine texture noticeably more powerful than the Bruno Paillard. A classic style of Champagne in the Bollinger idiom. L725302. Alcohol 12%. Note 2On average their blend is 60% Pinot Noir (35% comes from Ay), 25% Chardonnay and 15% Meunier. Two-thirds come from Bollinger's own vineyards - some 160 hectares (80% of the grapes come from Grands and Premiers Cru vineyards). Thirty crus go into the blend. Reserve wines make up 5-10% of the blend. Their reserve wines are uniquely produced from magnums of wine which are stored by cru, vintage and grape variety. The wine is aged for 3 years in their cellar. Dosage is 7-9g/litre. The wines are shipped three months after disgorgement. No disgorgement date is printed on the label. They produce approximately 1 million bottles from a total of 250 hectare -- 65% of the wine is made from grapes sourced from their own vineyards. What is the difference in taste and style? Paillard's wine is lighter, and fresher. It has more citrus flavour in the wine even if the Chardonnay is still a smaller component than the Pinot Noir, it is nonetheless a more significant component in the blend than that of Bollinger. But Paillard has also managed to preserve all the delicacy of the Pinot Noir. Overall the wine is fruitier with more finesse than the Bollinger. The Bollinger is strong, with body and structure but elegance too and a lovely velvet texture. Its aromas are more evolved, evoking fermentation processes, age, and more classic Champagne flavours. It has a more vintage feel. It has more power than finesse. Both are elegant wines but for different reasons. Paillard's Champagne plays on the elegance of Pinot Noir which is often, wrongly, thought of as being corpulent and powerful -- in Paillard's hands it is delicate and tactile. Bollinger's elegance stems from the harmony of its components. As an analogy one might think of a car such as a Mercedes roadster - stylish, muscular, and powerful (let's not forget the origins of Bollinger). To continue the analogy, the Paillard Champagne is more of a 1950s Jaguar sports car: curvaceous, feline and refined: a cousin of the Mark II Jaguar Bruno Paillard sold to provide start-up capital when he founded his business in the 1980s. 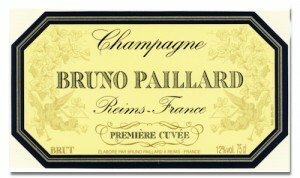 Paillard's Champagne achieves elegance through the whole process and ambition of the style of wine he wished to create. Bollinger's elegance stems from its history, balance, restraint and production method. Both wines have very small bubbles and bubble size is largely affected by the length of time a Champagne is aged. Both Paillard and Bollinger age their wines considerably longer than that required under Appellation rules. The size of bubbles is directly related to the quantity of carbon dioxide in a bottle of Champagne Note 3Uncorked, published by Princeton University Press by Associate Professor of Physical Sciences at the University of Reims, Gérard Liger-Belair.. Corks do not provide a complete hermetic seal of the wine, thus older wines have less dissolved carbon dioxide than when the ageing commenced, thus smaller bubbles than Champagne which has not been bottled for as long. But the size of the bubbles is also related to the velocity of the bubble as it travels up the glass. The less chance it has to grow, because it is moving fast, the smaller it will remain. On earth gravity provides an acceleration of the bubble through the liquid in the glass of some 9.8 m/s2. However, were you to enjoy these wines on the planet of Jupiter, the most massive planet in our solar system, gravity acceleration is some three times that of Earth and thus the bubbles would be even smaller. Try it some time. How can one account for this distinction in taste and style? Bruno Paillard Note 4Bruno Paillard started his company in 1981, When Bruno Paillard founded his firm, he owned no vineyards. Today he owns 20 or more hectares of which 12 hectares are Grands Crus vineyards. His experience and family ties has helped him build his network of loyal grape suppliers. who comes from a long line of Champagne 'vignerons' and brokers always wanted to create a wine that was elegant with plenty of finesse. It had to have structure and he wanted a 'clean' wine. He knew that the grapes he needed to make this wine came from the Côte des Blancs (for the Chardonnay) and the Montagne de Reims (Pinot Noir). The dosage, the addition of sugar at the moment of disgorgement had to be kept to a minimum. Bollinger Note 5Bollinger began Champagne production in 1829. 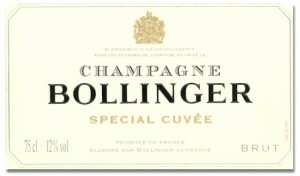 The name Bollinger 'Special Cuvée' was proposed by Harry J Newman to Georges Bollinger in a letter of 6th February 1911. Newman, known by his friends as 'Noggs', was a partner of Mentzendorff, the UK shipper of Bollinger. It was decided that the use of the title 'Special Cuvée' impressed drinkers that there was no ordinary non-vintage from Bollinger, (even if that is what it is - an 'ordinary' Bollinger non-vintage). The name's English origins also accounts for the Franglais. regard their Special Cuvée as not so much a classic (or ordinary) non-vintage Champagne but more of a multi-vintage blend: we look at this later. When Bollinger created the Special Cuvée at the beginning of the last century they probably had no particular aim except to please the mainly UK market at the time. Certainly the English led the way in terms of preferring a drier 'brut' style. The fundamental consideration of their wine, indeed for nearly all Champagne producers, is to produce a wine which is consistent year on year. Undoubtedly, the production methods used were conceived in order to maintain the unique character of the wine and thus maintain their loyal customers. Their large vineyard holdings, one of the largest in Champagne, provides the quality and consistency of the raw material. The mix of varietals is significant. The Pinot Noir if treated in a certain way will yield more vinous qualities than its near relation (Pinot Meunier). Pinot Noir expresses red or even black fruits and the Chardonnay can be depended upon for its finesse and also acidity and whilst often providing citrus flavours (lemon, lime even grapefruit) it can also suggest almond (raw to roasted). The Pinot Meunier will provide consistency and fruitiness (tropical fruits), even a little sweetness; when it ages, honey is sometimes an aroma which comes to the fore, but it is also a good varietal to have in your blend since it is less prone to frost and is thus more dependable. Pinot Meunier is not discussed too much but it is one of the most planted varietals in Champagne Note 6Pinot Meunier accounts for 33% of the whole area. Pinot noir 39% and Chardonnay 28%. The mix of these varietals will impact on the taste. Hence Bollinger's higher Pinot Noir component carries its signature. By the same token Paillard makes up his blend from a higher proportion of Chardonnay which will contribute to its finesse and citrus flavours. Both houses make a commitment to making all the wines themselves (even if they are sourcing grapes from around the Appellation), which is not the case with all top Champagne houses. Bollinger blends the wines from two years and makes up the balance with their reserve wines. Paillard keeps back their blend from the previous year which they then blend with the base year. So it is a different approach. Perhaps significantly Paillard routinely puts its wines though malo-lactic fermentation whereas Bollinger only do so for their wines in cask (oak casks), which may not always take off anyway, whilst preventing it in the stainless steel vats. The presence of wine which has not gone through MLF will add to its freshness coming from the higher acidity. Both houses use only the cuvée, or first pressing, (Bruno Paillard refers to this in the name of the wine - Première Cuvée) for making their wines. Note 7In exceptional years Bollinger may make use of the 'tailles' (second pressing) of the Chardonnay. The use of only the first pressing is an important qualitative process because it reduces the output which will impose an economic consequence on a company. Bollinger is the only Champagne house to publish a Charter defining the quality of their wine. It is this Charter which encourages them to refer to the Special Cuvée as a 'multi-vintage' blend. Only a small phrase but it is central to the whole way Bollinger think of their wine and thus present and market it to the world. At a tasting a few years ago held in Bordeaux of vintage Champagnes from all the top houses, Bollinger brought along their Special Cuvée - their non vintage 'blend of vintage wines'. Are they right? Firstly, one should say that the Special Cuvée is not a vintage Champagne under the definition of Appellation controls. In terms of its components it is very similar in content to other non-vintage Champagnes - a blend of wines from all around the Appellation, from different varietals and from as many as 12-15 different years, taking into account the reserve wines. It is, however, their unique way of preserving their reserve wines - in magnums - separated by year, cru and varietal which gives them a claim to this description. In the case of Paillard, for example, reserve wines will make up some 20-40% of the blend and these are essentially wines retained from the previous year's blending. So, although they will contain wines made from the start of the company's existence, a proportion of each year's blend is held back to add to the next year. Wines from the current vintage (known as the base year) will make up some 60%-80% of the non-vintage production for that year. In Bollinger's case their blend is made from specific years - the current and last year's wine production with the balance being made up from the wines aged in magnums. These magnums of wine are interesting for a number of reasons. Magnums are considered to be the optimum size for ageing wines. The ageing of the wines will add a degree of complexity which will greatly enhance the blend. They provide an extraordinary historical snapshot of the quality of the grapes in any particular year and not only their ability to age but how. They will provide an accuracy in blending which is almost unique in Champagne. But Champagne regulators are sticklers for form and definition. To describe a Champagne as 'vintage' the wine must all come from grapes harvested that year. They must reach a level of alcohol which is at least 11% and they must be aged for at least 3 years before release and the yield is limited. Bollinger would through its production process meet all of these stipulations in their simple phrase except, obviously, the wine is not made from a specific harvest. More to the point they are able, until the final blend is made, identify all the wines which make their blend - the year, the varietal, and the cru. It seems appropriate then that their description stands -- a 'multi-vintage' blend. It is interesting to note how the relatively small proportion of reserve wines impact so enormously on the taste of Bollinger but it also becomes clear just how important they are in maintaining the consistenty of the blend. Both companies age their wines, once bottled, for at least three years which is twice the normal permitted time. Paillard stores his wine for a minimum of 4 months prior to shipping after disgorgement with a recommendation that the wine be stored for at least 6 months before consumption. Bollinger tend to keep theirs for some 3 months prior to shipment with no recommendation nor do they print the disgorgement date on the labels (although they do this for their RD). Paillard is such a strong believer in the effect of disgorgement (and thus prints the dates of disgorgement on the label) that he even sells a boxed set of Champagne with different disgorgement dates. I agree with him that knowing disgorgement dates is crucial and yet few Champagne houses bother with the information. A simple expedient if you do wish to age your wine before drinking it would be to write the date you purchased the bottle onto the label. Depending where you bought the bottle from and their turnover the wine may be recently shipped or, if you're lucky and the wine has been well-stored, it will already come with some bottle age. Both these wines are examples of elegant Champagnes. Both have fine bubbles. The fruits of the grape Pinot Noir are present in both and the additional character of the Chardonnay is evident in that of Bruno Paillard. The Bollinger - a 'multi-vintage' blend - has vintage characteristics in its aromas and bouquet and flavours. It is a powerful wine. Paillard on the other hand doesn't wish to create this kind of multi-layered complexity and persistence. Elegance and finesse are the prime motivations for him. There's nothing wrong with enjoying both these wines (I do) but you may find that depending on the occasion, the food you may be eating, your mood that day, that one will fit the bill better than the other. The important thing to recognise is that amongst the Champagne houses disparate styles and tastes exist which are worth exploring and develop your own list of favourite Champagnes. Champagnes need to be drunk cool but most people drink them too cold. Warm Champagne is not always pleasant -- it's a bit like looking under the bonnet of the car. If you want a vintage style Champagne then the Bollinger is for you. But if you want to drink a more modern and refreshing style, then you might prefer the Bruno Paillard. 1. ↑ Average blend is 45% Pinot Noir, 33% Chardonnay, 22% Pinot Meunier. Paillard own some 24 hectares of which 11 are designated Grand Cru. The company sources grapes from a further 76 hectares. Grapes from almost 36 crus go into the blend. All its own vineyards are maintained with organic agricultural practices. Reserve wines make up 20-40% of the total. The wine is aged for a minimum of 3 years before disgorgement. The wine is shipped 4 months following disgorgement with a recommendation that it should not be drunk until 6 months after the disgorgement date on the bottle. Dosage is no more than 8g/litre. They always use malo-lactic fermentation. They produce approximately 450,000 bottles per annum from a total of 100 hectares. The name of Bruno Paillard is unique in Champagne in that it is the name of the brand, the founder of the company and the name of the winemaker. 2. ↑ On average their blend is 60% Pinot Noir (35% comes from Ay), 25% Chardonnay and 15% Meunier. Two-thirds come from Bollinger's own vineyards - some 160 hectares (80% of the grapes come from Grands and Premiers Cru vineyards). Thirty crus go into the blend. Reserve wines make up 5-10% of the blend. Their reserve wines are uniquely produced from magnums of wine which are stored by cru, vintage and grape variety. The wine is aged for 3 years in their cellar. Dosage is 7-9g/litre. The wines are shipped three months after disgorgement. No disgorgement date is printed on the label. They produce approximately 1 million bottles from a total of 250 hectare -- 65% of the wine is made from grapes sourced from their own vineyards. 3. ↑ Uncorked, published by Princeton University Press by Associate Professor of Physical Sciences at the University of Reims, Gérard Liger-Belair. 4. 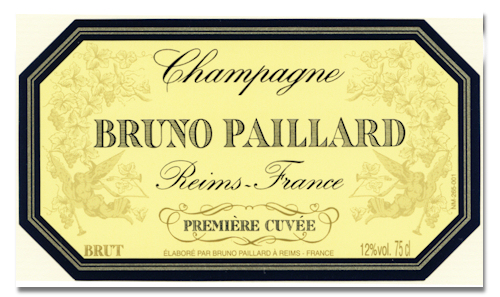 ↑ Bruno Paillard started his company in 1981, When Bruno Paillard founded his firm, he owned no vineyards. Today he owns 20 or more hectares of which 12 hectares are Grands Crus vineyards. His experience and family ties has helped him build his network of loyal grape suppliers. 5. ↑ Bollinger began Champagne production in 1829. 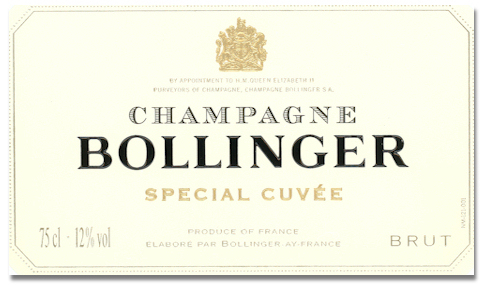 The name Bollinger 'Special Cuvée' was proposed by Harry J Newman to Georges Bollinger in a letter of 6th February 1911. Newman, known by his friends as 'Noggs', was a partner of Mentzendorff, the UK shipper of Bollinger. It was decided that the use of the title 'Special Cuvée' impressed drinkers that there was no ordinary non-vintage from Bollinger, (even if that is what it is - an 'ordinary' Bollinger non-vintage). The name's English origins also accounts for the Franglais. 6. ↑ Pinot Meunier accounts for 33% of the whole area. Pinot noir 39% and Chardonnay 28%. 7. ↑ In exceptional years Bollinger may make use of the 'tailles' (second pressing) of the Chardonnay. The use of only the first pressing is an important qualitative process because it reduces the output which will impose an economic consequence on a company.